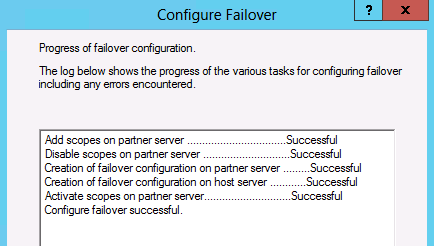 The DHCP server failover feature provides the ability to have two DHCP servers serve IP addresses and option configuration to the same subnet or scope. DHCP failvoer in Windows Server 2012 provides support for a maximum of two DHCP servers, and the failover relationship is limited to IPv4 scopes and subnets. 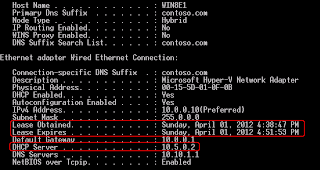 Reference from "Understand and Troubleshoot DHCP failover in Windows Server 8 beta". 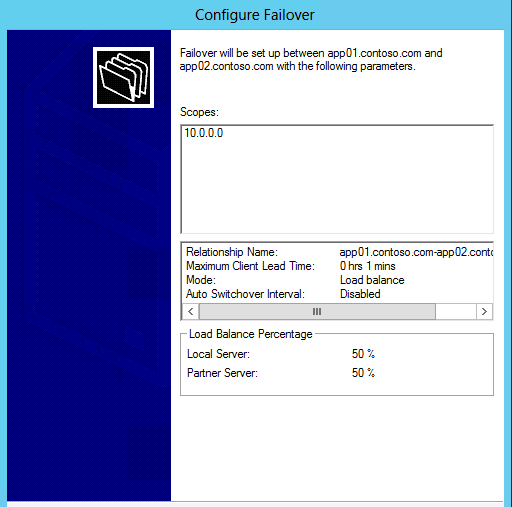 2 member servers named App01 and App02 which are installed Windows Server 2012 for configuring DHCP failover. The IP address of App01 is "10.5.0.1" and the IP address of App02 is "10.5.0.2". 1. On App01, log in as Domain Administrator. 3. Click "Add roles and features". 4. On "Before you begin" screen, click "Next". 5. On "Installation Type" screen, select "Role-based or feature-based installation", click "Next". 6. On "Server Selection" screen, click "Next". 7. 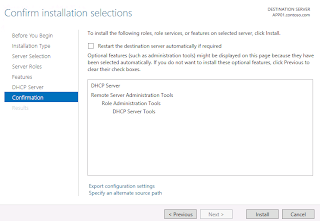 On "Server Roles" screen, check "DHCP Server", then click "Add Features". 9. On "Features" screen, click "Next". 10. On "DHCP Server" screen, click "Next". 11. On "Confirmation" screen, click "Install". 12. 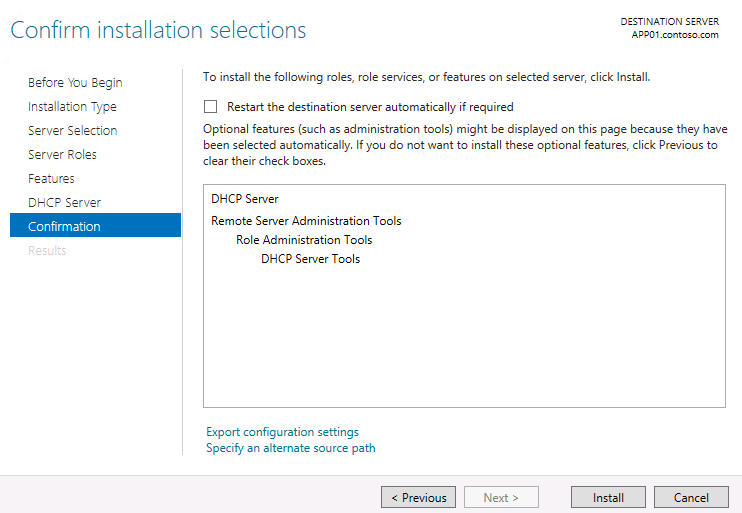 When installation finished, click "Completed DHCP configuration". 13. On "Description" screen, click "Next". 14. On "Authorization" screen, select "Use the logged in user's credentials". Remark: You can assign an "alternate credentials" for authorize this DHCP server. 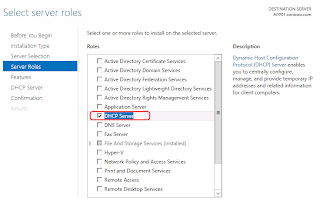 For more information: Please read "Authorizing DHCP server by a non-enterprise administrator". 17. Repeat step 1 - 16 on App02. 18. On App01, launch "DHCP Console". 19. 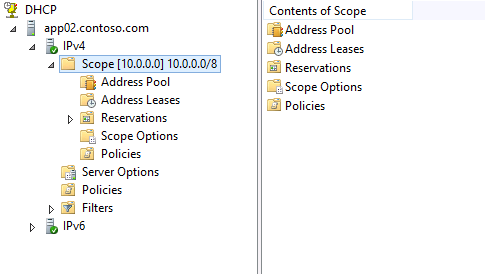 Expand "app01.contoso.com > IPv4", right-click "IPv4", select "New Scope". 20. 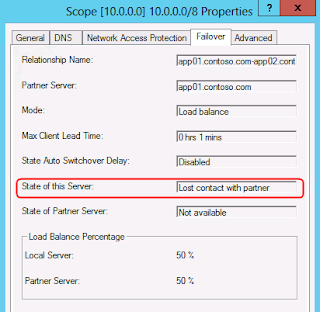 Create a DHCP scope for 10.0.0.0/8 network. 21. 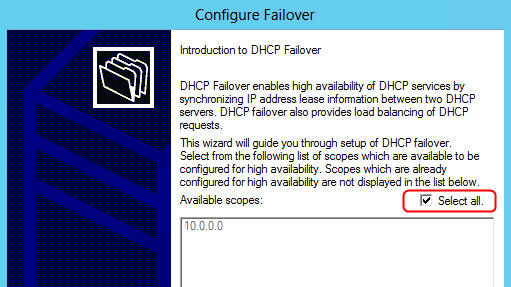 Right-click the DHCP scope, select "Configure Failover". 22. On "Introduction" screen, still check "Select all". 24. 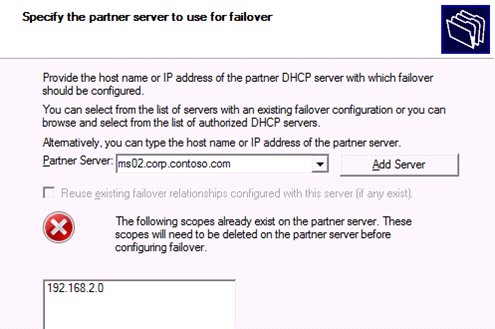 On "Specify the partner server to use for failover" screen, click "Add Server". 25. 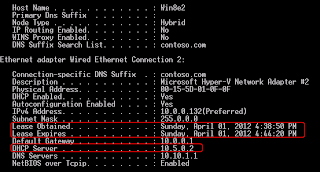 Select "This authorized DHCP server > app02.contoso.com". Remark: If you configures split scopes in both DHCP servers, you need to remove the DHCP scope in the partner server before you set up DHCP failover. If the scopes haven't been removed, you get the following error. 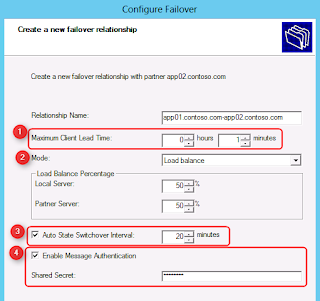 On "Create a new failover relationship" window, there are some configurations. Relation name: A unique failover relationship name is required to identify the failover setup between two servers. 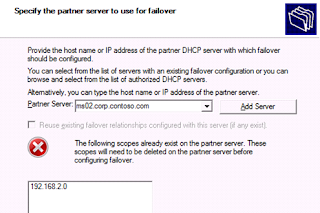 Since multiple failover relationships can exist with one or more DHCP servers, each relationship name is required to be unique on a server. Maximum Client Lead Time: It defines the temporary lease period given by the failover server to a new client. Mode: There are two modes for DHCP failover which are "Hot Standby" and "Load balance". In hot standby mode, two servers operate in a failover relationship where an active server is responsible for leasing IP addresses and configuration information to all clients in a scope or subnet, while a secondary server assumes this responsibility if the primary server becomes unavailable. A server is primary or secondary in the context of a subnet. In a load balance mode deployment, which is the default mode of operation, the two servers simultaneously serve IP addresses and options to clients on a given subnet. The client requests are load balanced and shared between the two servers. Auto State Switchover Interval: A server that loses communication with a partner server transitions into a communication interrupted state. The loss of communication may be due to a network outage or the partner server may have gone offline. Since there is no way for the server to detect the reason for loss of communication with its partner, the server will continue to remain in communication interrupted state until the administrator manually changes the state to partner down. Alternatively, DHCP failover has a provision for automatic transition to partner down state based on a time out interval. This is a configurable element called the auto state switchover interval. The default value for auto state switchover interval is 10 minutes. 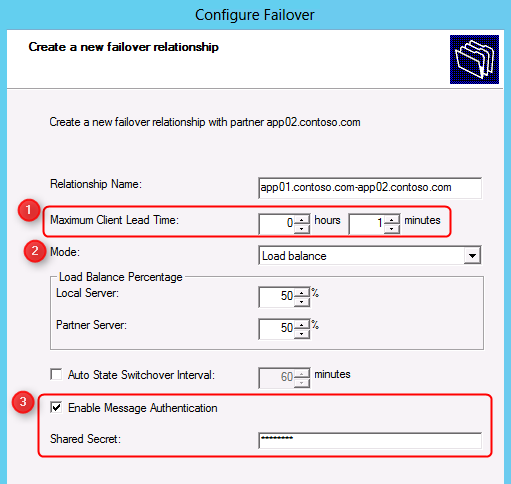 Enable Message Authentication: To configure message authentication, the DHCP failover setup wizard prompts the administrator to provide a shared secret. As part of the failover relationship creation, the failover setup wizard provisions the shared secret for message authentication to each of the servers in the failover relationship. 28. Next to "Maximum Client Lead Time", change to 1 min for testing. 29. Next to "Mode", still select "Load balance". 30. Check "Auto State Switchover interval", and then change to "20" minutes. 31. Provide the "Shared Secret". 35. 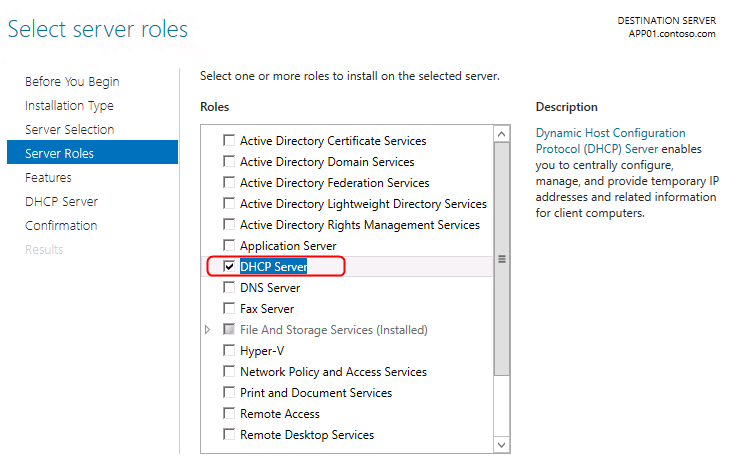 Right-click the DHCP scope, select "Properties". 36. 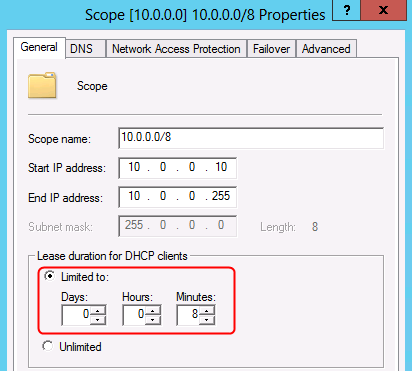 Next to "Lease duration for DHCP clients", change to "Limted to" 8 mins. 38. Go to App02, launch "DHCP Console". 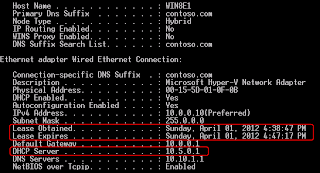 The DHCP scope was created automatically. 39. Right-click the scope, select "Properties". 40. 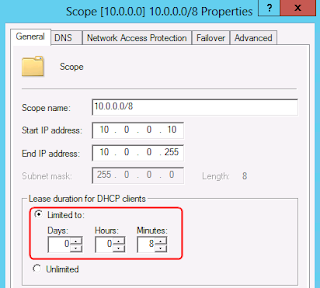 Next to "Lease duration for DHCP clients", change to "Limted to" 5 mins. 1. Power on 2 workstations. 2. Check the IP adresses on 2 workstations by "ipconfig /all". The DHCP failover is functioning. 3. Disconnect the network cable on App01. 4. 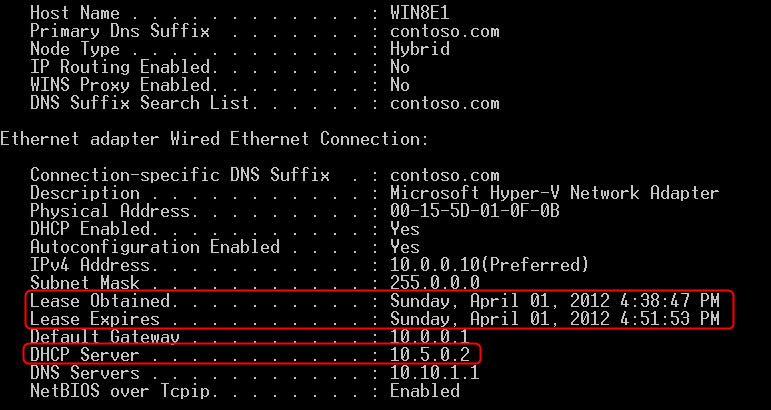 When the lease time expired, perform "ipconfig /all" on workstation1. 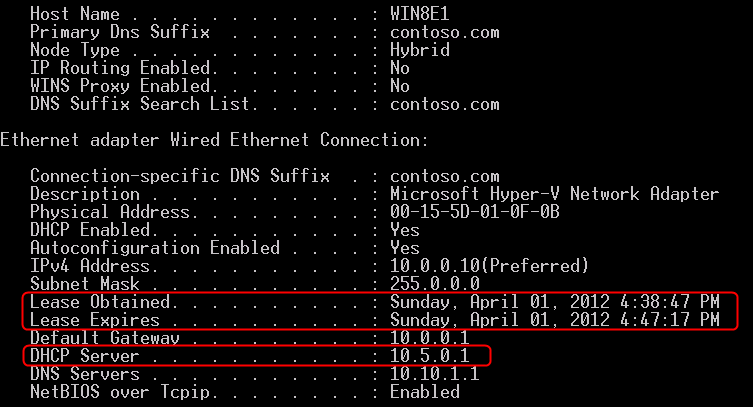 Because the App01 cannot be contacted, workstation 1 obtained the same IP address from APP02. 5. 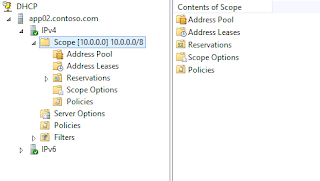 Back to App02, right-click the DHCP scope, select "Properties". Now, the DHCP scope is take over by App02. 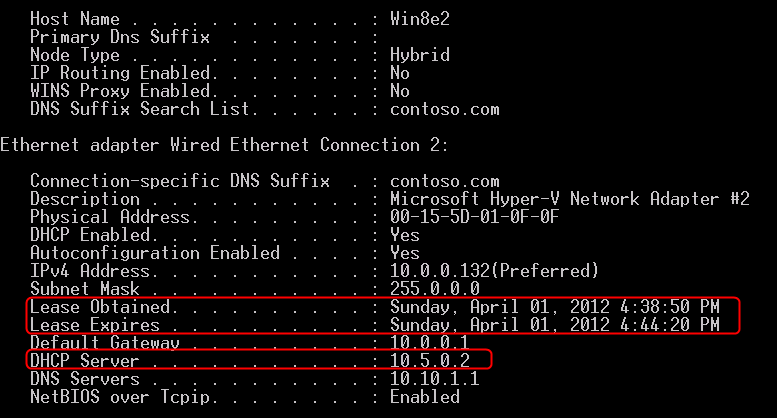 It proves that the DHCP failover is functioning. Remark: By default, DHCP failover synchronizes the IP address lesase information. However, it doesn't synchronize the "Reservations" and "Scope Options". 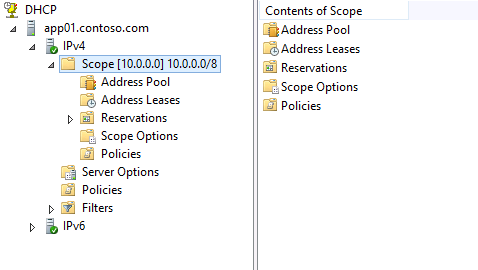 To synchronize the "Reservations" and "Scope Options", we need to perform "Replication Scope". 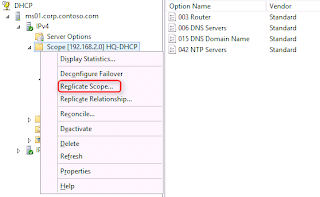 Remark: If you more than 1 DHCP scope in the failover relationship, you can select "Replicate Relationship" to update "Reservations" and "Scope Options" of all DHCP scopes in the failover relationship. Remark: If you perform "Replicate Scope" in a server, which hasn't been configured "Reservations" and "Scope Options", the latest settings in the partner server are overridden. Remark: Make sure TCP port 647 hasn't been blocked in both DHCP failover servers. If this port is blocked, the Address Leases of DHCP failover servers aren't synchronized. Just a quick note - if you have special Predefined Options (ie - vendor class identfier definitions, like Option 60 for Aruba access points) in the "first" DHCP server, you have to manually predefine them in the "second" server before setting up the failover. The failover setup won't copy them over. But, it will copy over definitions in the scope (ie - like the Option 43 setting response for the Aruba APs). just guessing what happens if the 2 boxes stop talking to each other after the relationship is configured...example 647 tcp get blocked, so the 2 boxes will not share the lease info...will the clients start getting dupe IP's after the MCLT is reached ? Assuming the scenario is load balance. Both DHCP servers are still functioning without share the lease info but the clients will not get duplicate IP address because both servers own a half of DHCP range of the scope. Assuming one of DHCP server is down and when the client is renewing the IP address, a client also can renew the same IP address. Remark: The result is based on testing environment. Trying to set DHCP failover for scope with reservations based on MAC address, but it does not copy over taht particualr scope. All other scopes are copied over fine to the DHCP server #2. Is that not avaiable in this DHCP failover infrastructure? 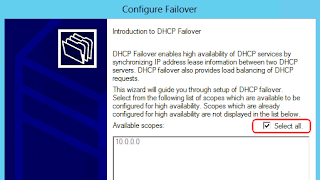 By default, DHCP failover synchronizes the IP address lesase information. However, it doesn't synchronize the "Reservations" and "Scope Options". 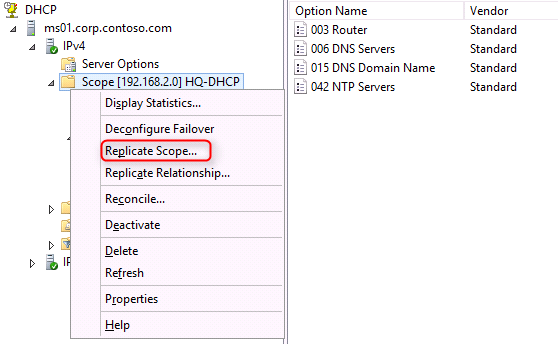 To synchronize the "Reservations" and "Scope Options", we need to perform "Replication Scope".